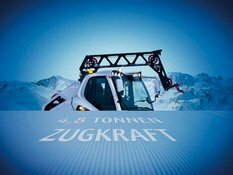 A New Winch conquers the Steep Pistes of the World! PRINOTH presents the new winch technology. Clear the pistes for the new SHERPA! With automatic WINCONTROL pulling force regulation for use with 4.8 ton pulling force on the Beast and 4.5 ton on the Bison. With these attributes, the new SHERPA Winch from PRINOTH makes the preparation of extremely steep pistes even more efficient, simple, and safe. We will look forward to seeing you there for an informative meeting with our experts. In order for your trip to be doubly worthwhile, we will present the new winch to you both on the BEAST and on the BISON. Welcome to the winch test with the new SHERPA and our team! More demos will follow soon! For more information please contact our sales agents or service sites.